I am not a drinker, but gastrobars, as the name suggests, offer more than just drinks. The Armoury at South Beach Quarter, for example, has a decent food menu and some of the dishes are not bad at all. The Cheeseburger Spring Rolls ($10 for four) are a good idea, with grilled minced beef, cheddar cheese, dill pickles and mustard rolled in a spring roll skin and deep-fried. You don't have to worry about dislocating your jaw trying to bite into a multi-layered burger or ketchup and mustard running down your hands as you bite into it. But if you prefer your burger to look like one, get the Spicy Bacon Avocado Burger ($20). The beef patty is topped with slices of avocado and crispy bacon, lettuce, jalapeno relish and sriracha mayo - all sandwiched in a toasted brioche bun. My mouth waters just remembering how those flavours come together. The OG Buffalo Chicken Wings ($16 for eight pieces) are good too, with the deep-fried wings covered in a tangy sauce. They come with a blue cheese dipping sauce, but I like them fine on their own. Use the sauce for the accompanying carrot and celery sticks instead. Sawachi from Keyaki. The large porcelain platter is filled with an array of raw and cooked food. Shikoku is the smallest of the four main islands of Japan, the other three being Hokkaido, Honshu and Kyushu. It is also the least known among Singaporean travellers. The current promotion at Keyaki, featuring the island's cuisine, is therefore a good introduction to what it has to offer, foodwise. One of the most striking features is the Sawachi. Contrary to the common Japanese practice of serving food course by course in dainty portions, this is a large porcelain platter filled with an array of raw and cooked food. 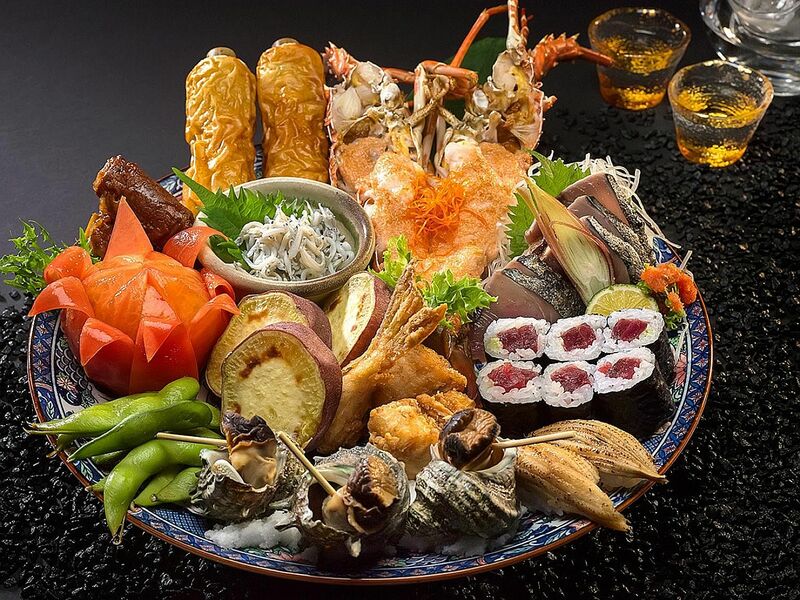 Here, you find tuna roll sushi, sea eel sushi, tomato, edamame, bamboo shoot, grated radish with baby sardine, deep-fried puffer fish, baked sweet potato, seared bonito, mini turban shell and grilled lobster with cod roe sauce - all arranged beautifully on the plate (photo). Get the Sawachi Course ($170 a person, minimum two people), which comes with a starter of deep-fried tofu with lotus root, a sashimi course that includes the unusual mikan tai (a sea bream that feeds on mandarin orange) and AWA wagyu beef udon. The udon is another Shikoku speciality. The noodles are thinner than those served in other restaurants here and have a chewy texture. Other sets as well as a la carte are also available. Gyu katsu, or Japanese breaded deep-fried beef cutlet from Ginza Kushi-Katsu. Tonkatsu or Japanese breaded deep-fried pork cutlet is easily found here, but gyu katsu - the beef version - has only just been introduced here at Ginza Kushi-Katsu, which opened in Paragon mall last month. The eatery opened with just Australian beef fillet (from $20.80 for 90g) and US Angus tenderloin (from $45.80 for 180g) for its gyu katsu (photo). But it has recently introduced Kobe cuisine wagyu beef from Australia at $44.80 for 90g and $65.80 for 180g. If budget is not an issue, get this as it has much more flavour than the other two types of beef. 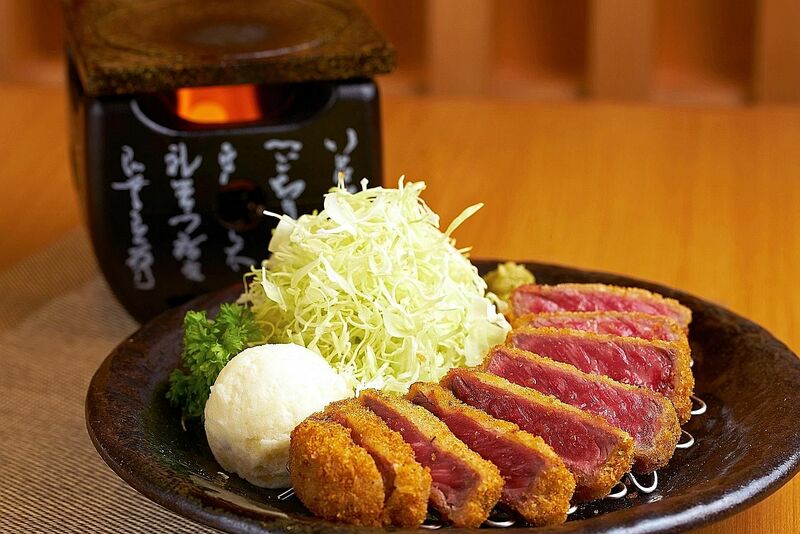 The katsu comes with medium-rare beef encased in a golden coat of crispy crumbs. For those who prefer their beef more cooked, a mini teppan is placed on the table for them to grill the meat to a doneness of their liking. I, however, like it the way it is. You can top up $4 for a set meal, which comes with a bowl of rice, miso soup and mini panna cotta. The katsu comes with three dips: wasabi soya sauce, mustard mayo and Maldon sea salt. For me, the wasabi soya sauce works best. The eatery, as its name suggests, also serves kushi-katsu - skewers of different ingredients that are breaded and deep-fried. These include pork loin ($2.90), prawn ($4.90) and gyoza ($2.90). Compared with Han, the fine-dining restaurant in Odeon Towers which introduced kushi-katsu to Singapore, the versions here are rather rough. But the prices are a lot friendlier. Bak chor mee topped with fried fish maw at Ding Ji in Bishan Street 24. I love it when hawkers improve their offerings with good-quality ingredients for those who do not mind paying for them, but still keep their original and more affordable options on the menu. Ding Ji in Bishan Street 24 is one of them. 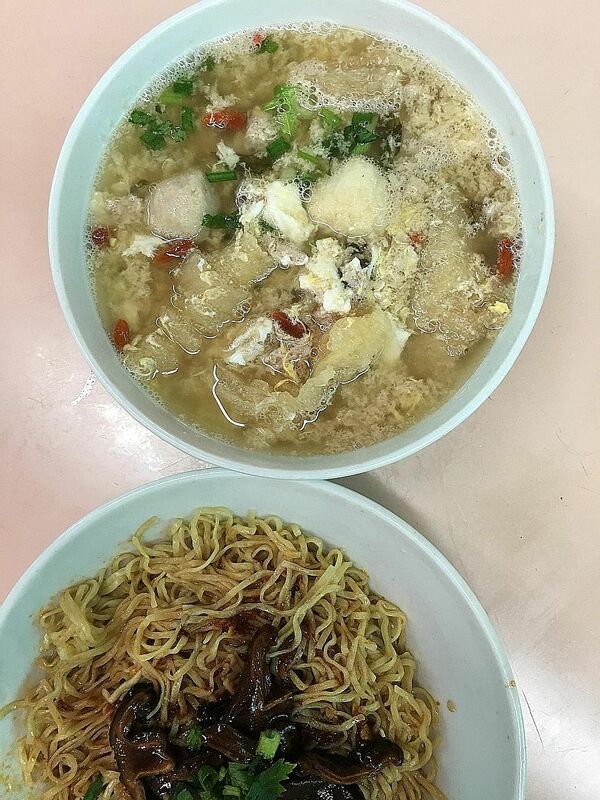 Opened by the Fei Siong Group, it is part of a chain of hawker stalls selling fishball noodles, bak chor mee (minced meat noodles) and laksa that has been around for some time and has outlets around the island, including one that opened recently in Toa Payoh North. But not all the outlets sell the same items. What caught my attention was a Facebook post by a friend showing a bowl of bak chor mee soup topped with fried fish maw. I like both bak chor mee and fish maw, so it did not take me long to scoot over to Bishan during lunch to the kopitiam in his post. Ding Ji is not the first to add fish maw to bak chor mee. I have previously recommended in this column another stall, Seng Kee in Serangoon Gardens, which offers a similar version for $9 a bowl. But Ding Ji's (photo), at $8, is cheaper. The noodles are served dry, topped with strips of stewed mushroom. The fish maw comes in a separate bowl of eggdrop soup, together with fishballs, dumplings, pork and pig liver. The soup is delicious, with a robust pork stock and the distinct flavour of dried sole. I like the noodles, too, which are thin, flat and springy. The dish is not as good as Seng Kee's - the noodles need a bit more black vinegar to perk up the flavours - but comes close. And for those who find $8 too much to pay for kopitiam fare, Ding Ji also offers normal bak chor mee, sans fish maw, for $3.50. Book a meal at The Armoury or Keyaki with Chope.